Alright, it’s the end of January. How are you doing on those resolutions? Or was your resolution to stop making resolutions and make changes for the better any darn time you want? 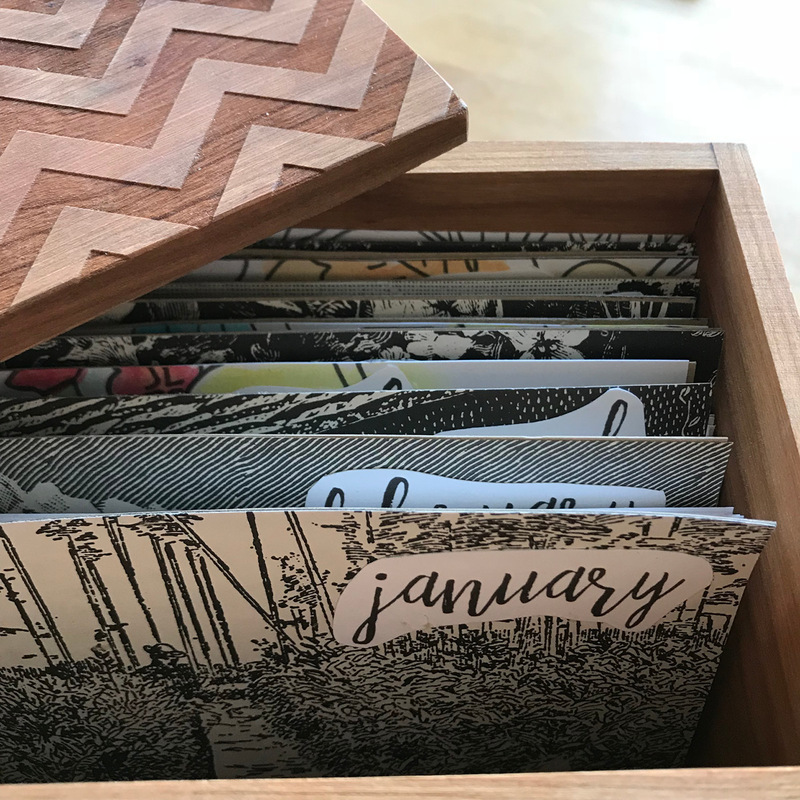 That’s more my speed and when I found this idea for a recipe box journal I thought it was the perfect, low pressure way to start recording my family’s memories. This journal is a recipe box filled with note cards, one for each day, with dividers for each month. 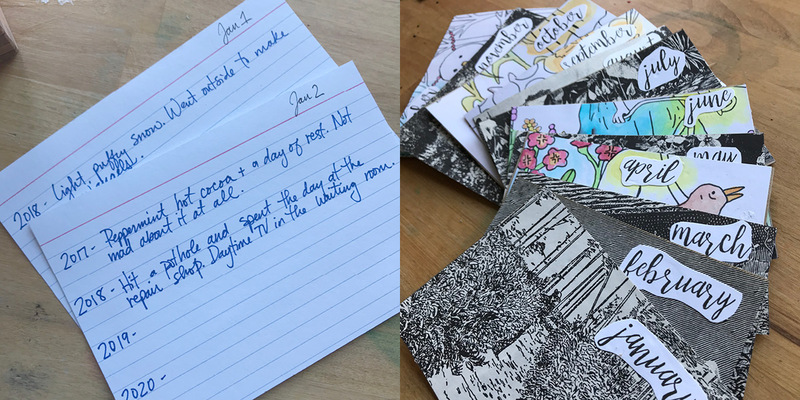 On each note card there is enough space to write just a couple lines for each day over five years- basically like the 5 year journals or one-line-a-day journals you may have heard of. That also means that you can start any day of the year you want, and also end any day you want, and skip any day you want. Just make a note of which year it is you’re writing for that day. To create mine, I used one of the beautiful, laser cut wooden recipes boxes we carry at Homespun from Richwood Creations. These are beautiful keepsakes that will last a lifetime, perfect for saving family recipes or memories. Not only do you get a unique and high quality box, but part of your purchase is donated to youth programs in Applachia. This box fits 4×6″ note cards, and for the dividers I cut 12 sheets of 8.5 x 11″ cardstock into 4.5 x 6″ rectangles. Depending on how the lid of your box fits on, you may need to experiment with sizes for these. 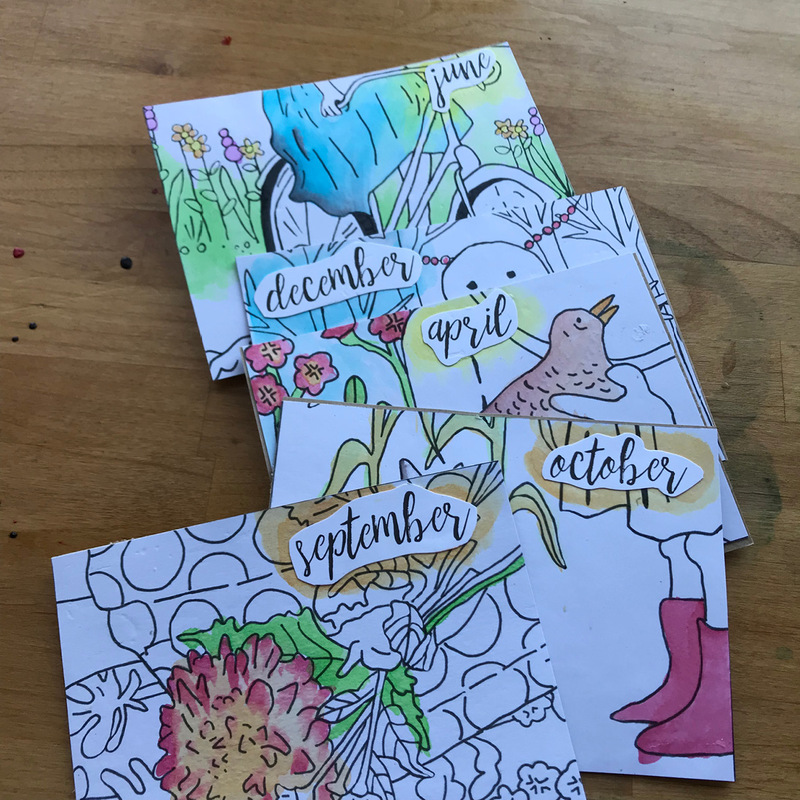 Since I was working on this at the beginning of the new year, I found an old 2017 calendar with beautiful illustrations by Amy Rice Art and decided to use those to decorate my divider cards. I added some color with my son’s crayola watercolors (honestly it’s just as important for me to have washable paints) and cut the names of the months from another wall calendar we had left at the shop. For some of the dividers I also used pages from a vintage book I had lying around, and I love the change from color to black and white as you shuffle through the cards. 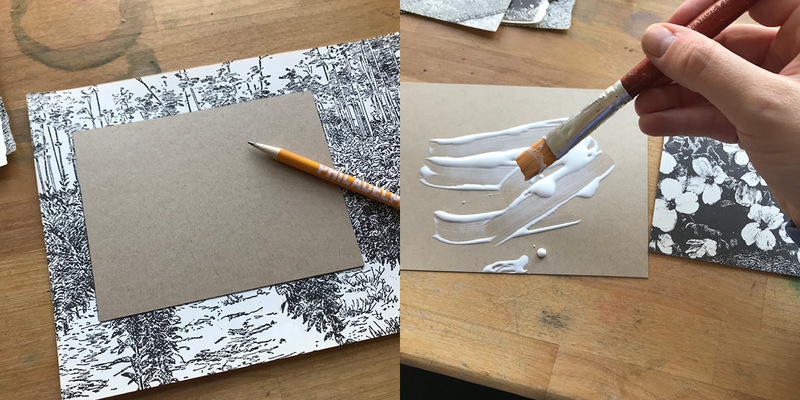 Since I was cutting from some really large images, I laid the divider card down on the part of the image I liked best, then traced it with a pencil and cut it out with my paper cutter. 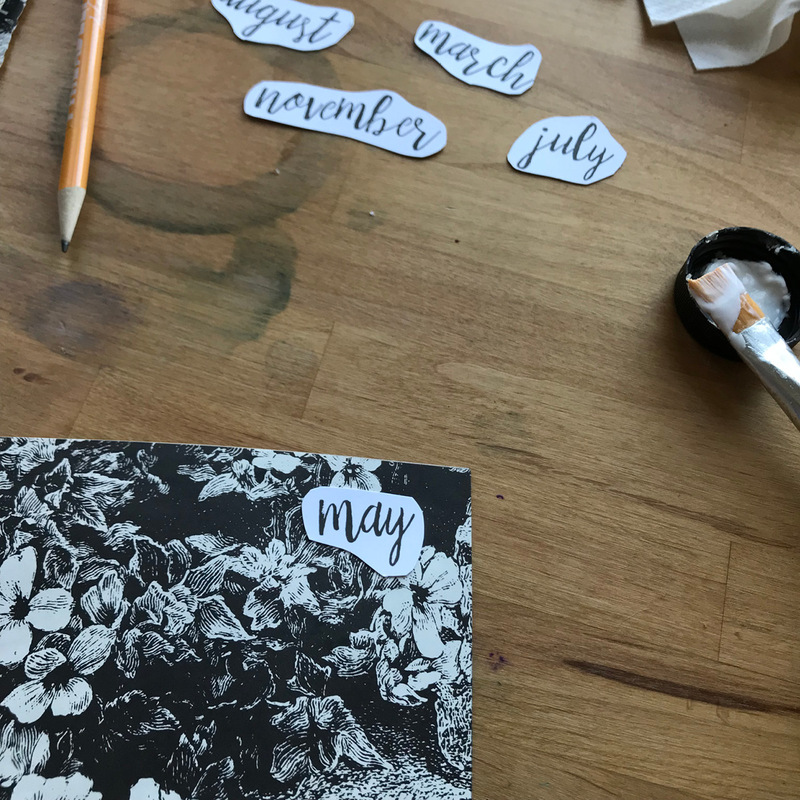 I glued the two together, added the cut month title, and smashed them in a press (a big dictionary works just as well). 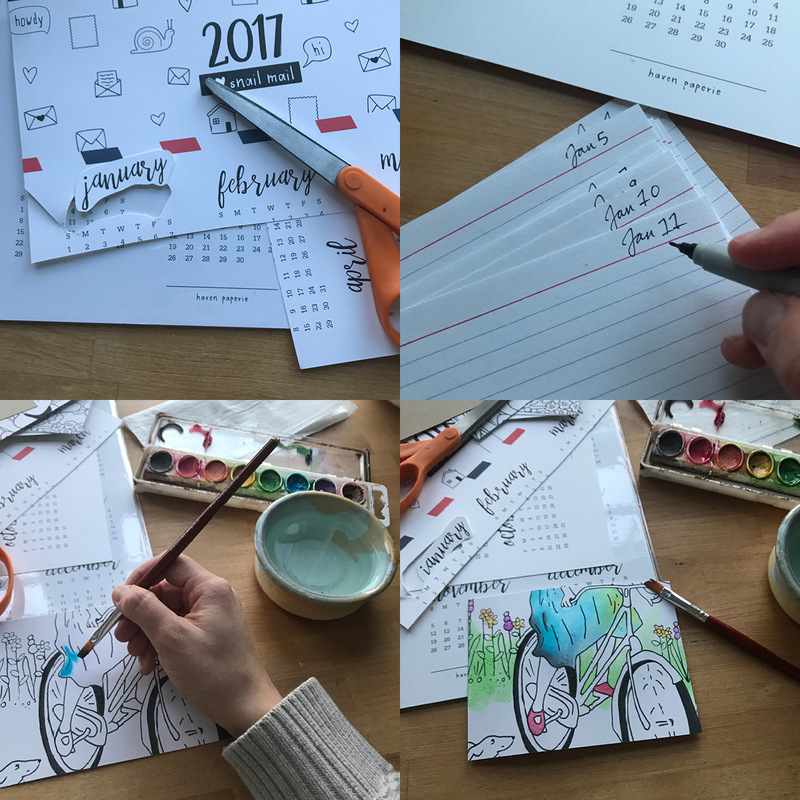 Count out the amount of note cards to correspond with the number of days in each month, then label the top of each note card with the date. Add years as necessary and you’re ready to go! Keep it anywhere around the house you think you’ll be most likely to take out a card and jot down a note. And just a tip from a lifelong journaler, ANY detail about your day is worth recording. You’d be surprised how entertaining your everyday details are 20 years from now. All of those little details change and become a memory and any recording of the day’s vibes is relevant. If you have children or other members of the family they can pitch in, too, and write something they did or remembered from that day. I hope you will take the time to make this project, it really pays off- especially the second year you’re writing and reflecting on that same day from the year before. Tag @homespunindy on social media if you make this so we can see your work! In case you missed it, winter is still alive and well in Indy (sigh). And all we want to do is cozy up to all our cozy things in store, like these Indiana pillows from Lois & Ruby. 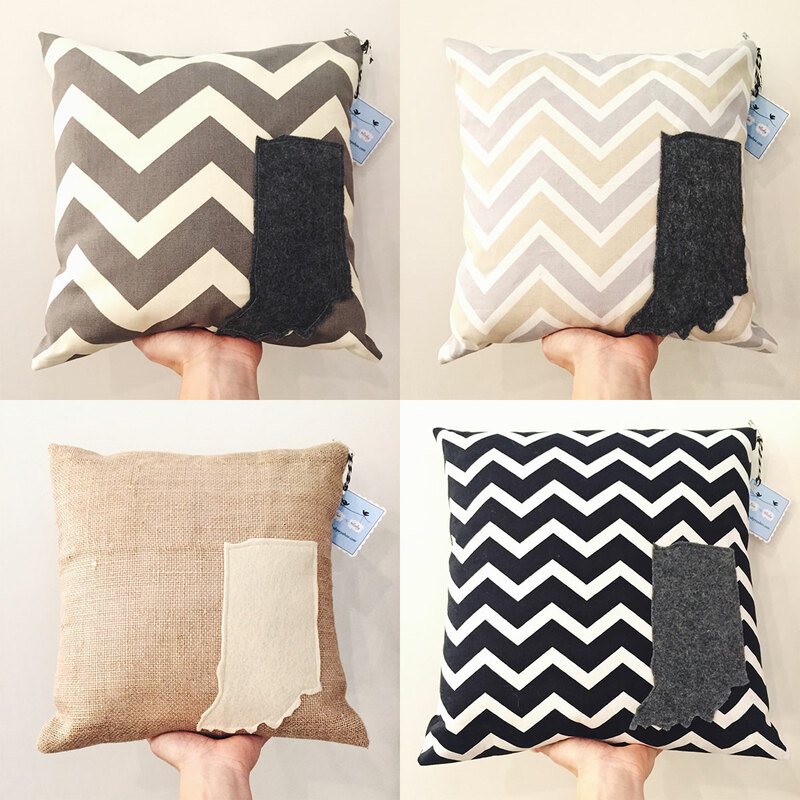 Available in multiple colors/patterns and two different sizes, these pillows range from just $32-$35. They are definitely a chic, and affordable addition to any decor. Stop in this weekend to see the whole selection we have in store! As if you needed an excuse to stay inside during this winter, our selection of DIY kits and books can at least help you feel productive, and creative, while you’re keeping warm indoors. 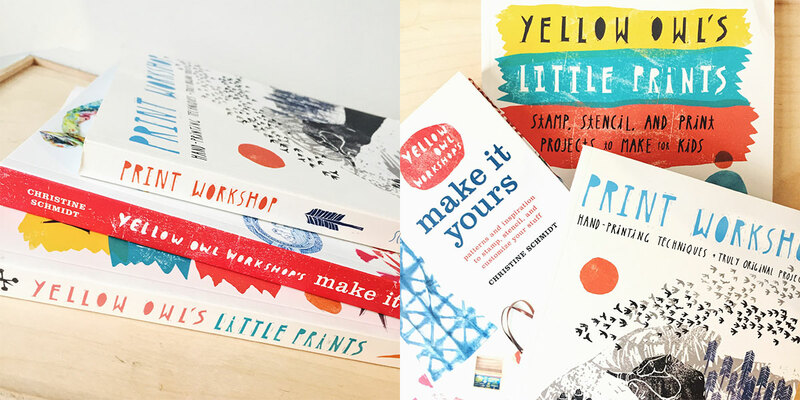 Christine Schmidt is the colorful creator behind Yellow Owl Workshop. 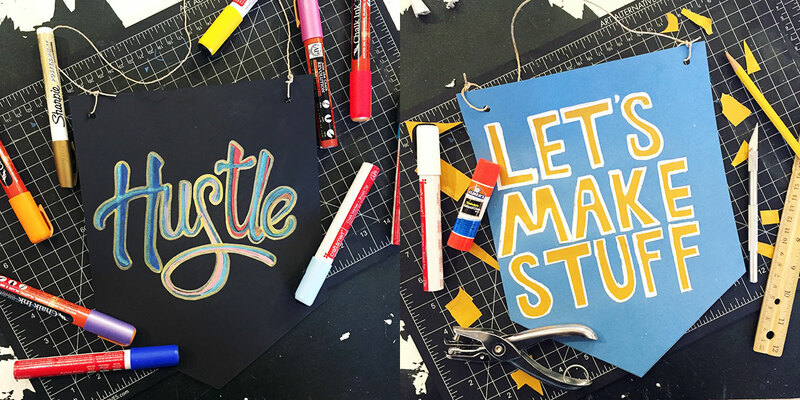 Her creativity sparked in grade school coloring contests, and she’s been making ever since! Her DIY books can help you learn hand printing techniques, Shibori dying, and so much more! There’s even a book on crafting with the kids, because we know how important it is to keep them busy, too, during this brutal winter! Ladies, it’s time to start dropping hints. 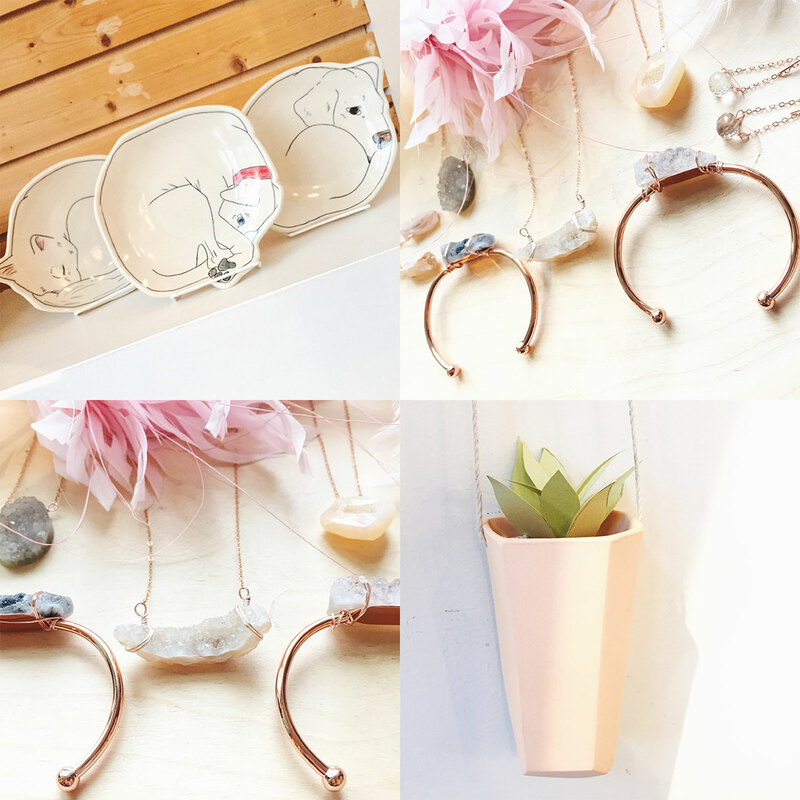 Local crystal goddess, Rana Salame, of Salame Jewelry Designs has stocked us with so many rose gold pretties that we can’t choose a favorite! From cuffs to necklaces to earrings, you can create the perfect, sparkly gift for Valentine’s Day! So, ladies tell your dudes, and then guys, we recommend coming in during our Local Love Event so you can pick up some jewels and place a flower order, all at the same time! We made it so easy for you! Crazy plant lady is the new cat lady in 2018. And, if you fall into that category, the ceramic crystal hanging planter from Bean & Bailey is definitely for you! It’s the last one we have in store too and it’s lonely. Been coveting our sleepy doggy and kitty plates from Early Bird Designs? Well, you’re in luck, because we are well stocked on those babies right now. They sell out quickly, so be sure to drop hints for those too and encourage your SO to come in sooner rather than later! 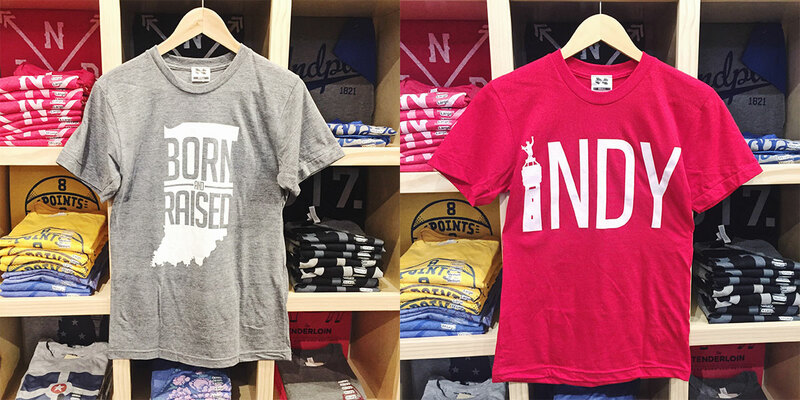 Long time vendor, Originalitees, has restocked us with some of their most popular designs -including the “Born and Raised” tee shown above! 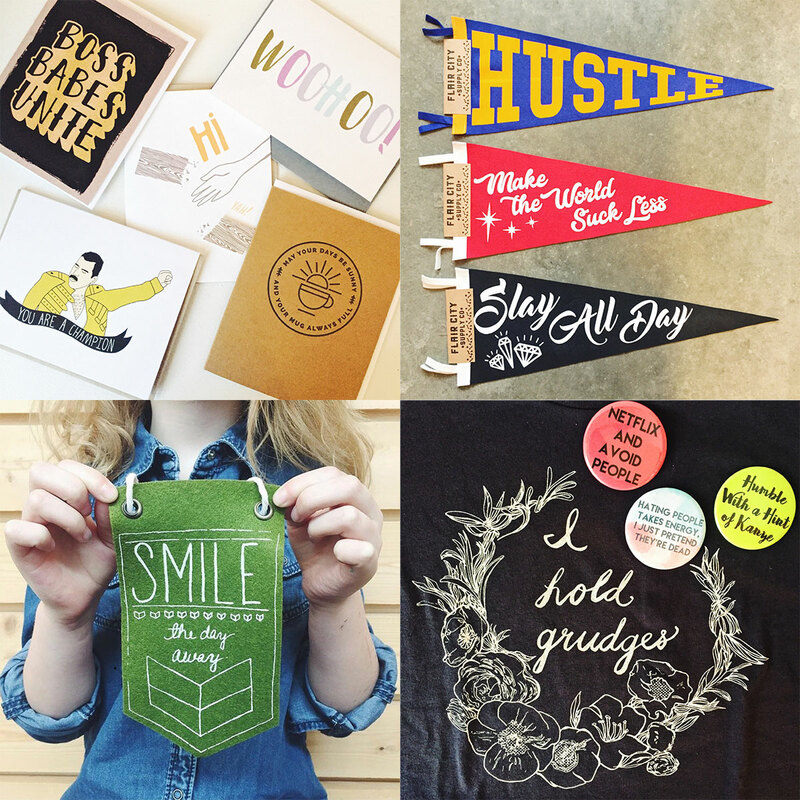 Motivational cards from Band of Weirdos, Haven Paperie, Cracked Designs, Arthurs Plaid Pants, and Igloo Letterpress, wall pennant banners by Flair City Supply Co., mini banner from Urban Bird & Co., grudges tee from Alison Rose Tees and snarky magnets by Flair City Supply Co. If you ever find yourself in need of some workweek encouragement, our card vendors have your back. You are a champion and never forget it. Did you think we had finished showing you everything from Flair City Supply Co.? Think again! Check out the rest of their wall pennants above! Talk about some permanent workweek motivation if you hang one of those on your office wall (and your office will look so much cooler too). Whether you get through the week by smiling and bearing it, or with a little snark, we’ve got something for all attitudes. We’re just a few weeks away from the best Valentine’s Day shopping event of the season! We’ll be featuring a candle-maker bar with the Onyx Exchange and you’ll be able to preorder Valentine’s Day bouquets from Willow and Star Flowers all in store on Sunday, February 11, from 1-4pm! Pick up a handmade Valentine’s Day gift too from one of our 400+ makers! Find more info about Onyx Exchange here. And more info about Willow and Star Flowers here. New Workshops Coming to You! While this workshop sold out in one day, don’t fret! We’ll have more workshops posted soon (and we’ll probably offer this one again based off of the great response)! So, keep checking back to find out all the ways you can get crafty with us in 2018! Have a happy, handmade weekend everyone! We told you we’d have some fun and exciting new workshops on the horizon! 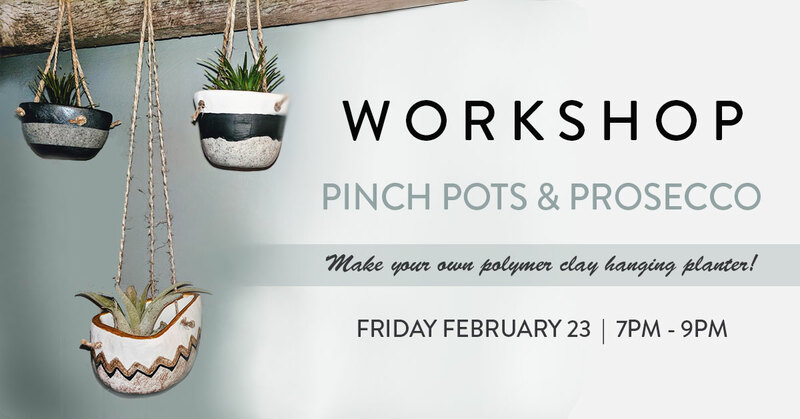 And we hope you’ll join us for our first session: Pinch Pots & Prosecco on Friday, February 23rd from 7pm-9pm! Karisa Cole, the all-around-creative behind Ribbon + Roving, will be teaching you how to craft your own hanging planter pinch pots using polymer clay! In this class you will learn how to sculpt your pinch pot, how to add textures, fire your pots, paint and design them, and create your hanger using twine! All supplies are included in the cost of this workshop and you’ll receive two baby plants so your planters will be 100% ready to be on display once you get home! And, as the name implies, we’ll have a little prosecco cocktail for you to sip on during your sculpting! Feel free to BYOB as well if you’re the noshy type! Click here to score your tickets before it sells out! 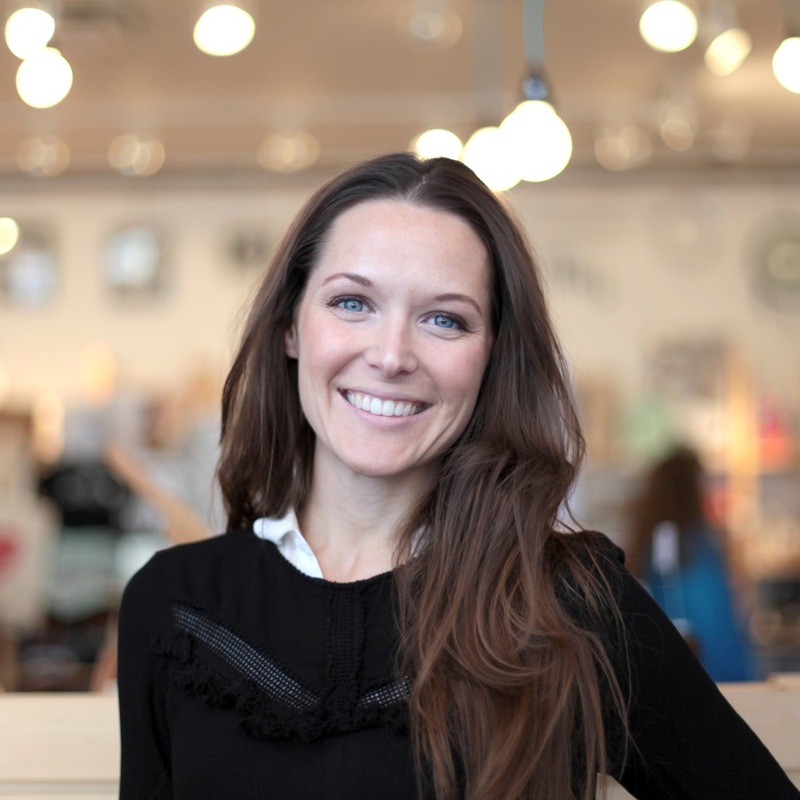 To learn more about our instructor, Karisa Cole, and to see all the crafty things she does, check her out on Instagram. On this week’s ICYMI blog, we’ll show you everything from jewelry to cards to Galentine’s Day ideas! Jump on trend with Pantone’s color of the year, Ultra Violet. 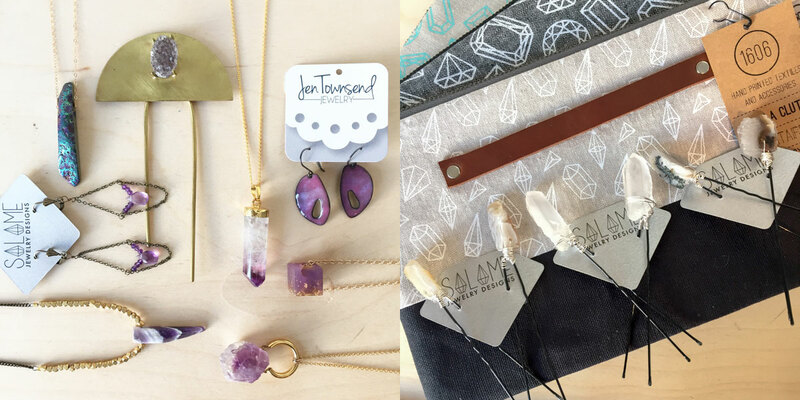 Our jewelry cases are packed with amethysts, enameled violet pieces, and eco resin designs speckled with gold flakes. -Doesn’t sound like a bad idea for Valentine’s Day to us. And with gemstones so on trend, why not pair Salame Jewelry Designs quartz hairpins with a 1606 Design Co. screen printed clutch. Ladies, rock those rocks. Got a gal by your side that can’t help going big and brazen? Well, we’re not just full of dainty gemstones. Havok Designs creates the statement geometric necklace above. And when paired with a striking red lip from Aromi Beauty, you’ve got a match made in eye-catching heaven. 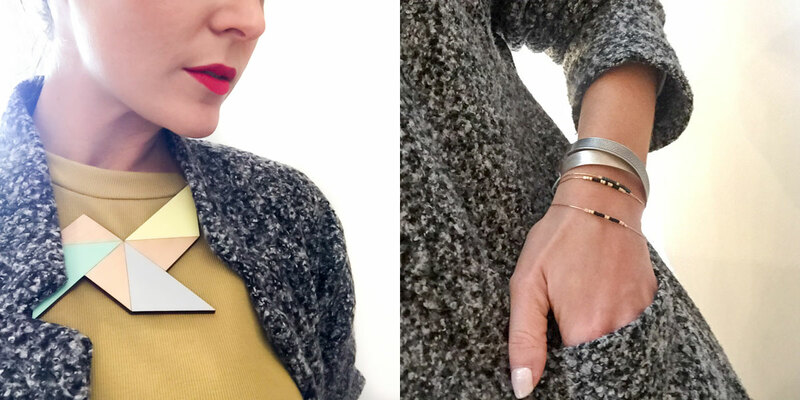 For the minimal, however, new etched metal cuffs from Tobias Designs are a safe medium between statement and everyday. And the new delicate, beaded beauties from the Natasha J. Collection are sure to please that layered bracelet lover. 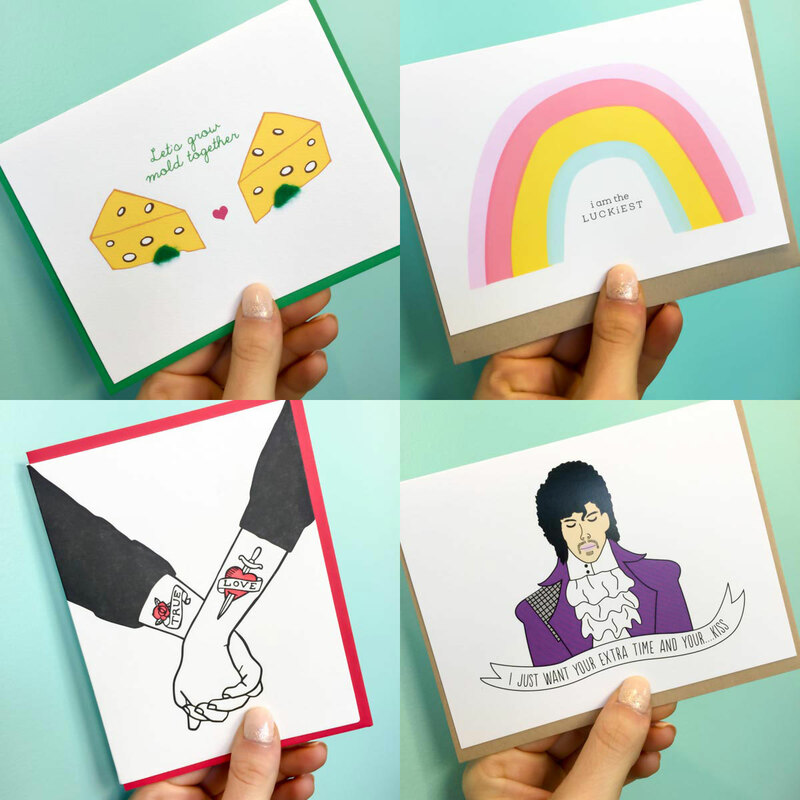 In case you were wondering where you should get your Valentine’s Day cards this year, we’ll just leave this little sampling right here. 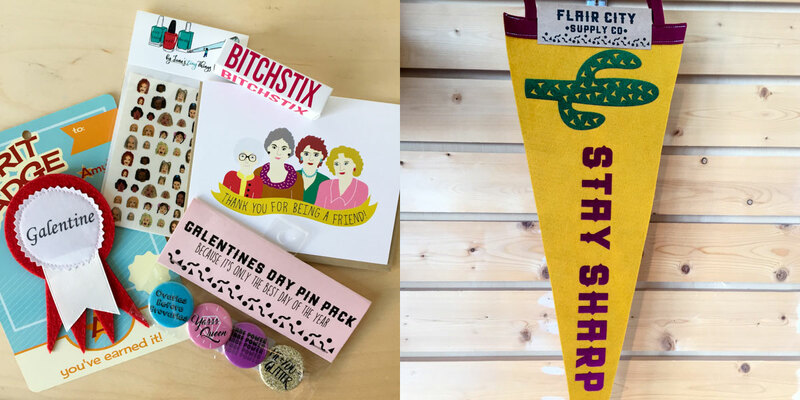 Because Leslie said it right, “Ovaries before broveries.” From pin pack sets to girl power nail decals, and Golden Girl cards, your best lady can feel like the queen she is with our handmade collection. 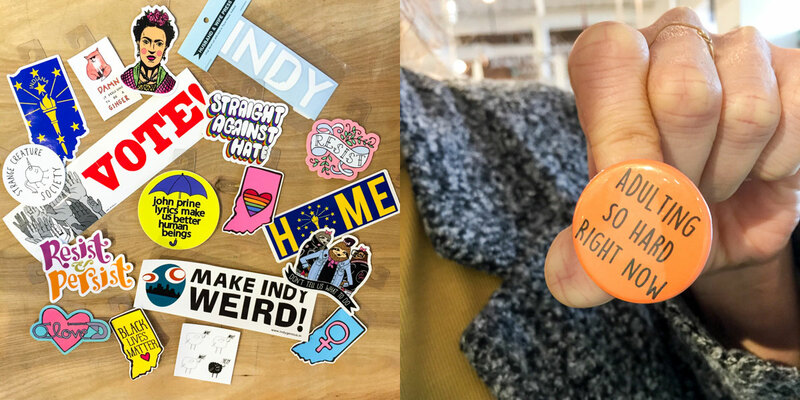 Flair City Supply Co. really has made our week. We’re a little obsessed with everything, but we can’t get over this “Stay Sharp” pennant banner. Perfect for the classroom, office, or kids room! 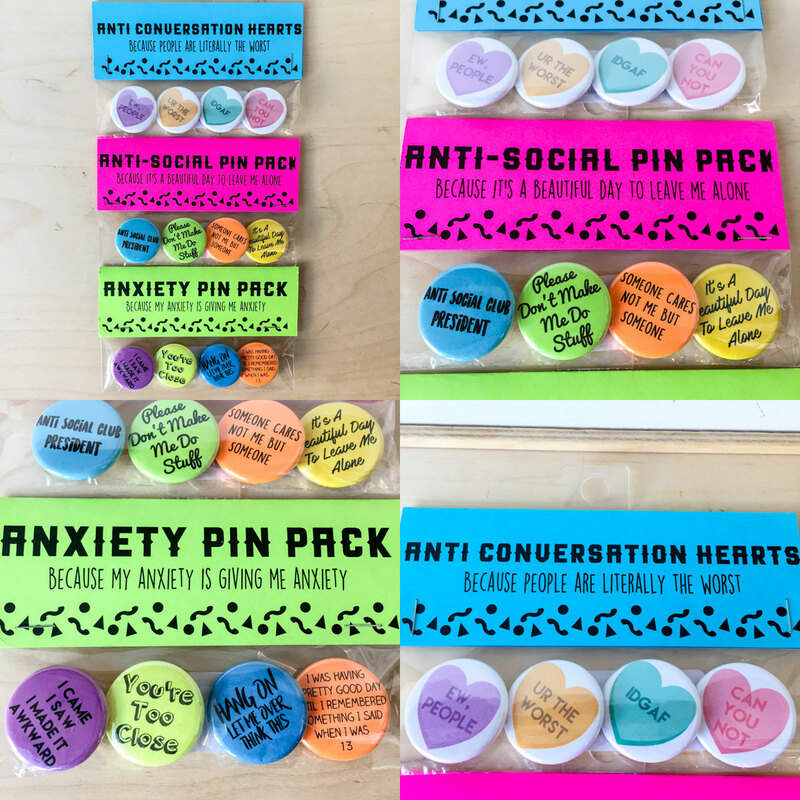 More pin packs from Flair City Supply Co. We’re relating real hard to that anxiety one. Have you guys checked out our sticker selection recently? Everything for the boss babes to the introverts to the politically passionate. And we still have those single pins from Flair City for you too. How hard did you adult today? Mab never disappoints. 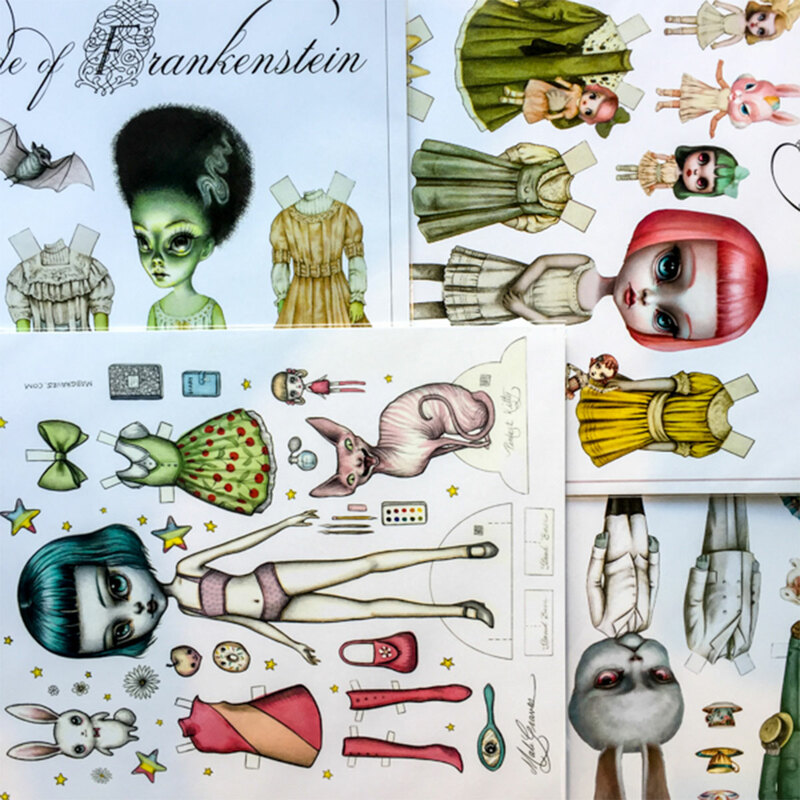 And this paper doll series is so cute that we want to cut them out and play with them all. But they’re also so cool that we want to keep them intact and frame them. Decisions. Decisions. The swirling, galaxy-like resin collection from Muro Jewelry is flying off of our shelves and we’re obsessed with that blue pendant that’s still left in store. Sara B., known for her specimen and mineral pieces, has expanded on her sleek, minimal pieces and we are 100% on board with it. Add some color to your kitchen with ceramic serving trays from Art by Jen F. And at just $26.00, you have no reason not to get them. Your house would also be happy to own that happy cloud/happy house print from Cordial Kitten. Don’t you want your home to be a happy one? 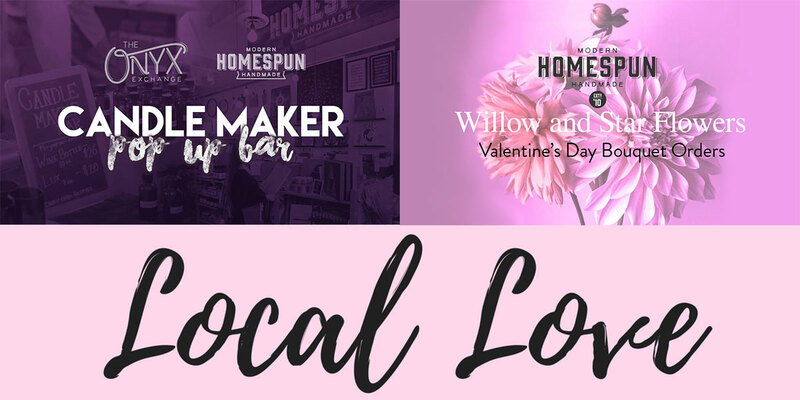 During our Local Love Event on Sunday, February 11th from 1pm-4pm, you can preorder Valentine’s Day bouquets, make a candle right in store, and, of course, shop our 400+ vendors. All that’s left is the dinner reservation. See more details about our event here! Do the Handmade Hustle with Us! We have some exciting new workshops on the books for 2018! And you’ll be able to take our classes right in the backroom of our store now! Keep following us on social media and keep checking our website for upcoming workshops to be posted! We’re so excited! Have a happy handmade weekend! We’ll be featuring a candle-maker bar with the Onyx Exchange and you’ll be able to preorder Valentines Day bouquets from Willow and Star Flowers all in store on Sunday, February 11, from 1-4pm! 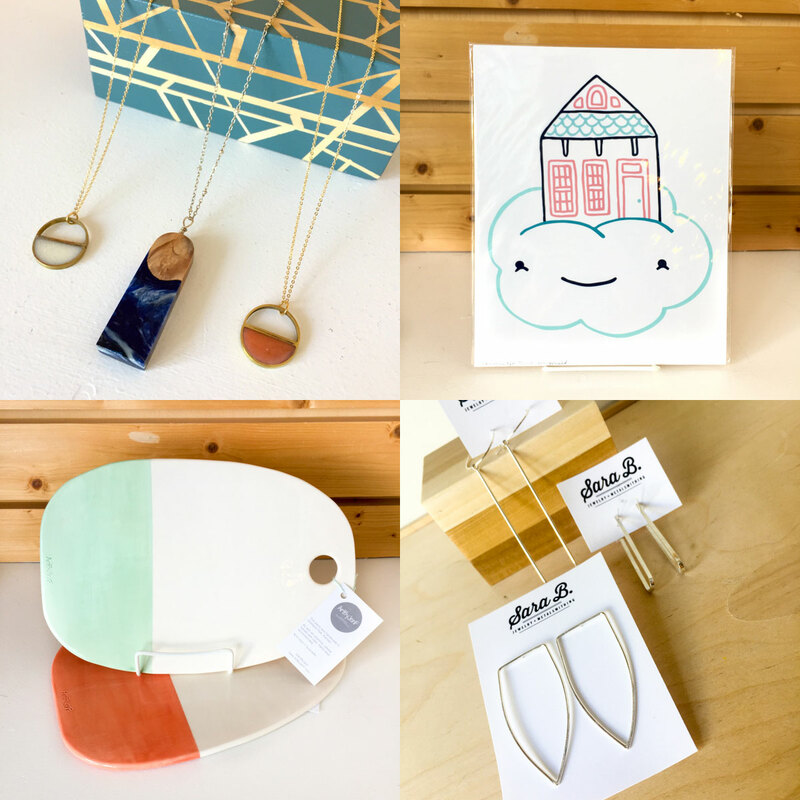 Pick up a handmade Valentines Day gift too from one of our 400+ makers!